On the wall above my desk hangs a photograph. A picture of a woman I have never met, and probably never will. After many attempts, over several years, I’ve been unable to gain any more information about her, or the circumstances of the photo, than is given in the caption of the picture. So, I deduce what I can from what is there. A women of about thirty years, dressed in a long dark coat over her shoulders, sits on a backless chair. She is thin, death-camp thin. On her knees are several sores. Her hair looks like it has been shaved and is just growing back; rough and not styled in any way, but as neat as can be made. Her body is turned to the left of the picture, her face almost square to the lens. Knees together, hands in her lap, back straight, head erect, she gazes straight into the camera and smiles. 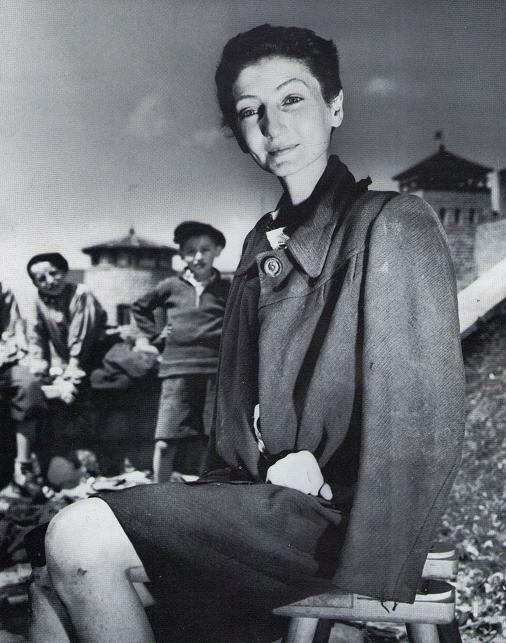 The caption reads: Nador Livia, a Jewish survivor of Gusen Concentration Camp. Before the war, she was a famous actress in Budapest. If I were given the task of proving that photography were an art, equal to painting, I would produce this photo and rest my case. I don’t believe an artist could capture what is in this face. A nation built a machine for the sole purpose of killing people like Nador. In the last days of the war, when men and material was desperately needed at any point of the compass in Germany; the leaders of that country, in their blind madness, poured precious fuel and transport into the effort to exterminate her and her kin. And there she sits, and smiles. She has just walked out of the closest thing to Hell ever created on this earth, and she sits there and smiles. When I feel oppressed or down, I look at Nador and I’m ashamed. She says; Tell me your sorrows, and I’ll tell you mine. But she says it with a smile. She tells me that even the greatest horror has, at last, an end; and that beyond the deepest sorrow, there is a time and a place to sit and compose yourself, and smile again. Posted on December 29, 2010, in Where This Road Goes and tagged actress, camp, concentration, courage, dignity, Fear, Germany, Holocaust, Jews, kill, Nador Livia, nazi, photography, Restore, War. Bookmark the permalink. 1 Comment. I saw this photo of Miss Nador a few years ago and thought the exact same thing; I’ve been fascinated with her ever since. Glad to know I’m not the only one!